Hogweed was @SpeciesofUK from 5th to 11th May, 2013. 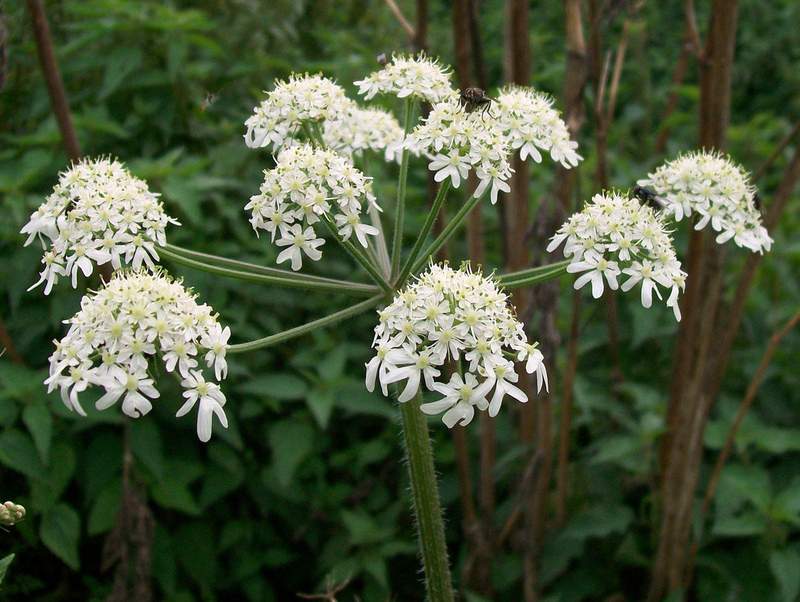 Common hogweed, Heracleum sphondylium, is found all across Europe (except Iceland) and into Asia and North Africa. Hogweed is commonly found in UK hedgerows, meadows and woods. Indeed, it's familiar even to many who don't know its name. The genus name Heracleum refers to the Greek mythic hero Heracles, on account of the plant’s size. 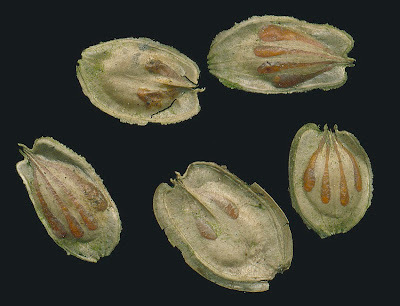 The species name sphondylium means 'vertebrae' and refers to the shape of its segmented stem. 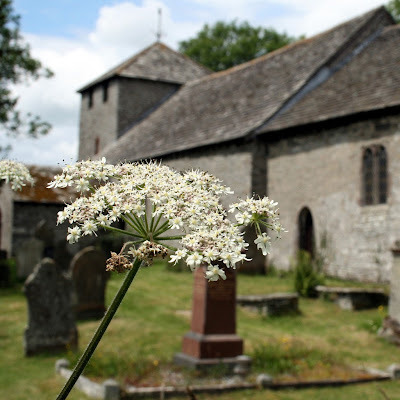 So what on earth is hogweed? 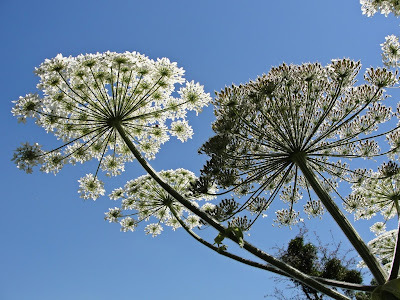 Common hogweed is one of the plants sometimes known as “cow parsnip,” although don't confuse it with cow parsley which is something altogether different. Hogweed is 'umbelliferous,' meaning its flowers are grouped on short stalks spreading from a single point, a bit like umbrella ribs. The flowers are off-white or occasionally pink. The petals are notched and are unequal in size. The petals on the outer flowers are enlarged. Hogweed is a biennial or a perennial. It grows to about 6ft max. Hogweed flowers are hermaphroditic, containing both male and female organs. They are pollinated by bees and flies. The flowers are usually seen from May to August. They are known for their unpleasant pig-like smell (hence the name), which attracts the flies which pollinate it. Hogweed leaves are broad, hairy and pinnate with several large lobed leaflets with toothed edges, on erect grooved hollow hairy stems. The flowers are succeeded by copious amounts of seeds which are flattened to help them to be carried by the wind. Hogweed does best in rich in nitrogen, moist soils or deep woodland but grows very easily even in full sun or partial shade. 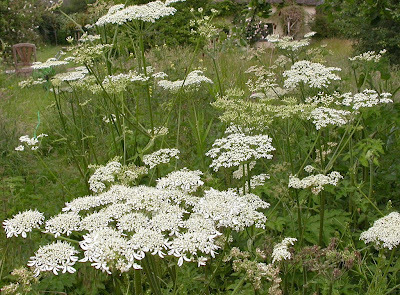 The umbellifer family, to which hogweed belongs, contains some of the most dangerous plants in the UK, such as hemlock. Giant Hogweed, Heracleum mantegazzianum, which is similar looking to hogweed but much bigger, contains a photosensitive juice that is extremely nasty. It can burn and permanently discolour skin when exposed to sunlight. Giant hogweed is not native to the UK. It was brought here in 19th century as an ornamental and unfortunately it is now invasive and widespread. 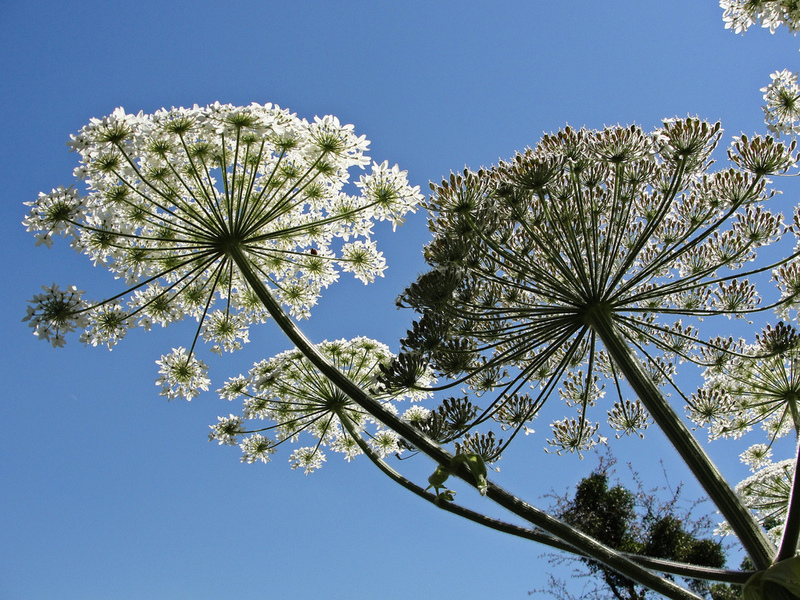 Here are some simple tips to help you tell apart common hogweed and giant hogweed. 1. The size. As you might expect, a mature giant hogweed is a giant! 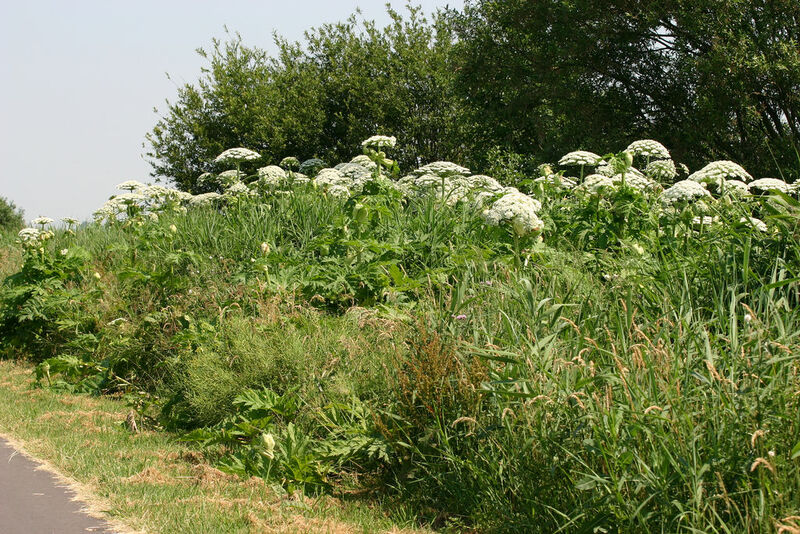 It typically grows to 7-16ft tall, whereas common hogweed gets to about 6ft max. 2. The leaves. 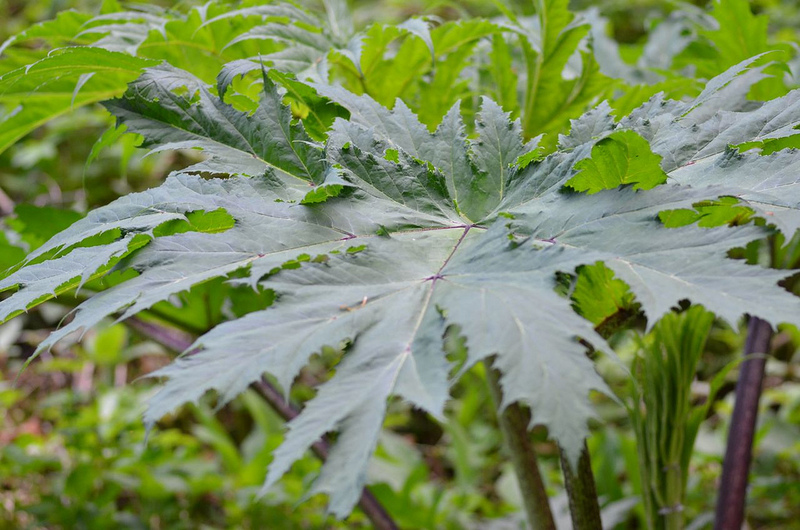 Giant hogweed has leaves with much more pointed segments and with downy hair. Common hogweed has more rounded leaves with bristly hair. 3. Common hogweed is more widespread than giant hogweed. 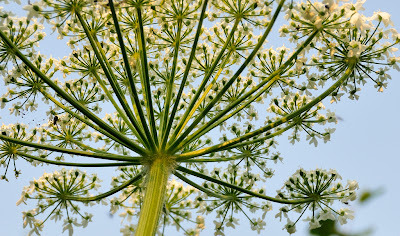 Giant hogweed tends to occur in large colonies as it has heavy seeds that don't travel far. 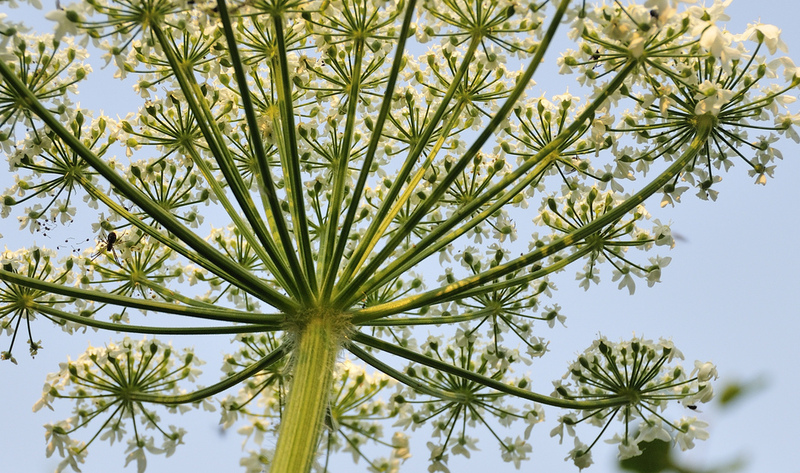 Common hogweed, which is native to the UK, is nowhere near as dangerous as giant hogweed. However, you still need to take care. 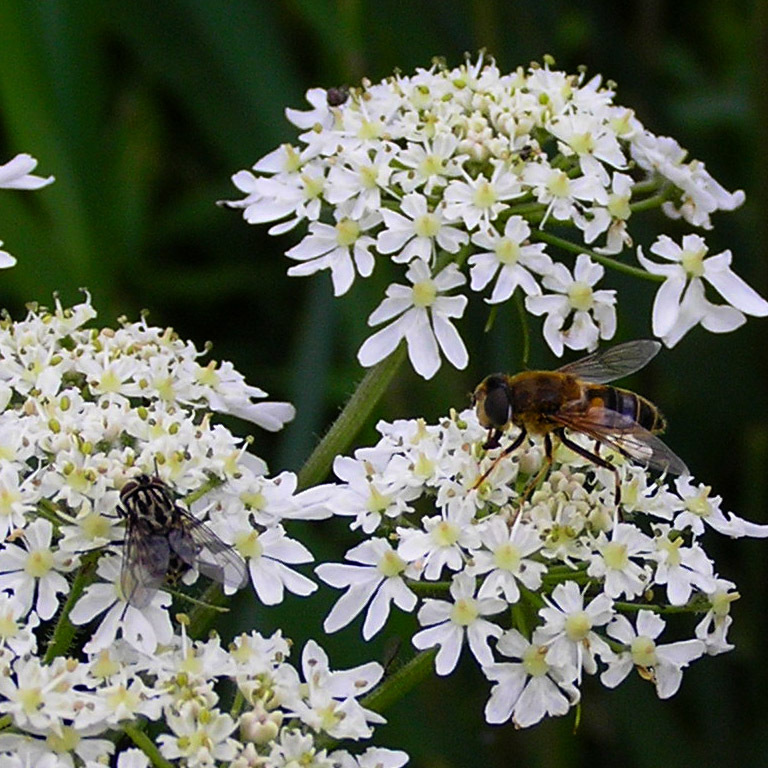 Even common hogweed does contain some subspecies that are phototoxic like giant hogweed, although to a lesser extent. 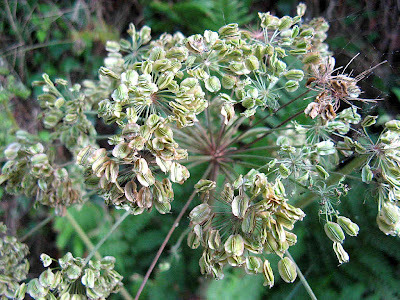 According to Plants for a Future, common hogweed subspecies transylvanicum, pyrenaicum, montanum, orsinii and alpinum are phototoxic, granatense and ternatum can sometimes be, and sphondylium (the most common one) and sibiricum are not. In spite of the above warnings about phototoxicity, common hogweed is perfectly edible. But of course you must make sure you are 100% confident about identification and how to handle it! 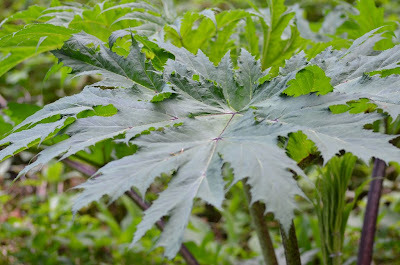 The hogweed leaves and shoots can be eaten raw or cooked. When harvested just as they are sprouting the stems have an asparagus-like taste. 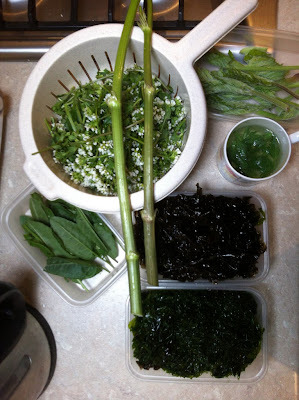 Hugh Fearnley-Whittingstall even cooked with hogweed shoots on the first ever episode of A Cook on the Wild Side. 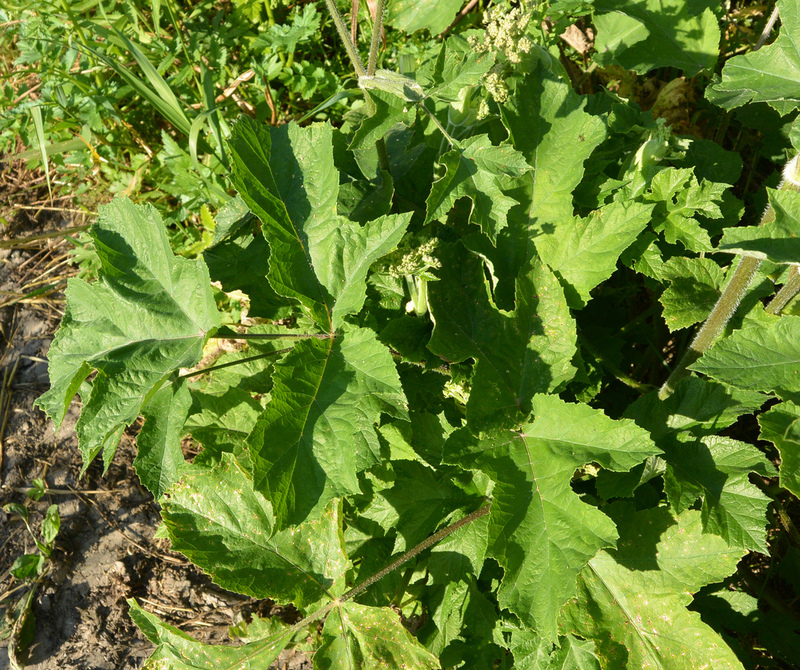 A sugar substitute can be extracted from hogweed. The leaf stems are left to dry in the sun and form a sugary substance. 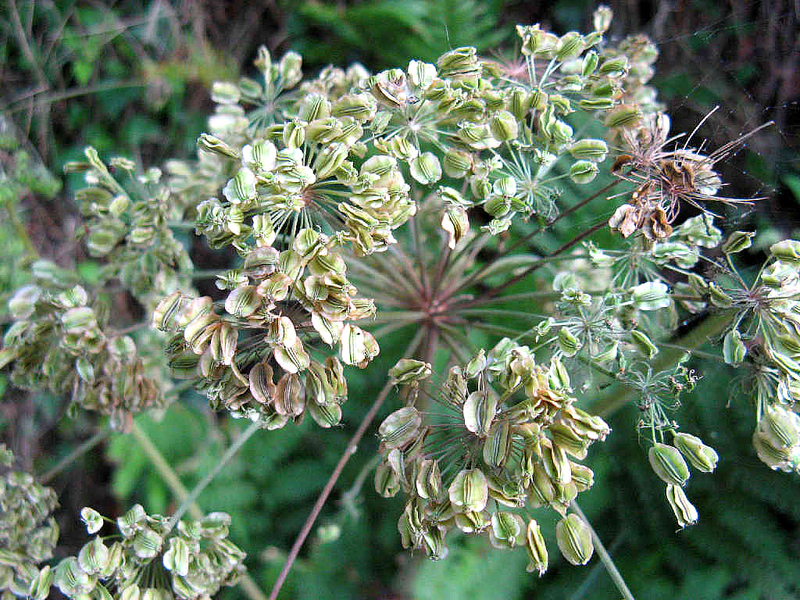 Hogweed peduncles can (before flowering) be eaten as a vegetable or added to soup. Even the roots can be eaten if boiled. If you’re really keen, here is a recipe for Hogweed Borscht (soup). 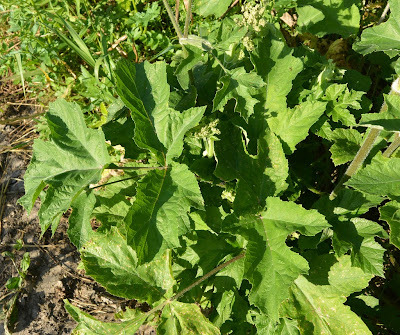 In addition to cooking, in the past hogweed has had medicinal uses. Its roots are rich in carbohydrates and the plant yields essential oils with sedative, expectorant and tonic properties. In North America, there is a species related to hogweed, Heracleum maximum, which the Americans call cow parsnip. It is the only species from the Heracleum genus found in North America. Heracleum maximum is very similar to our hogweed, and in fact and many authorities actually consider it to be a subspecies of hogweed, Heracleum sphondylium subsp montanum, or a variety. Whatever its classification, Heracleum maximum has been used by many native American people, as poultices for sores, as food, for dye, and even to make toy flutes for children. 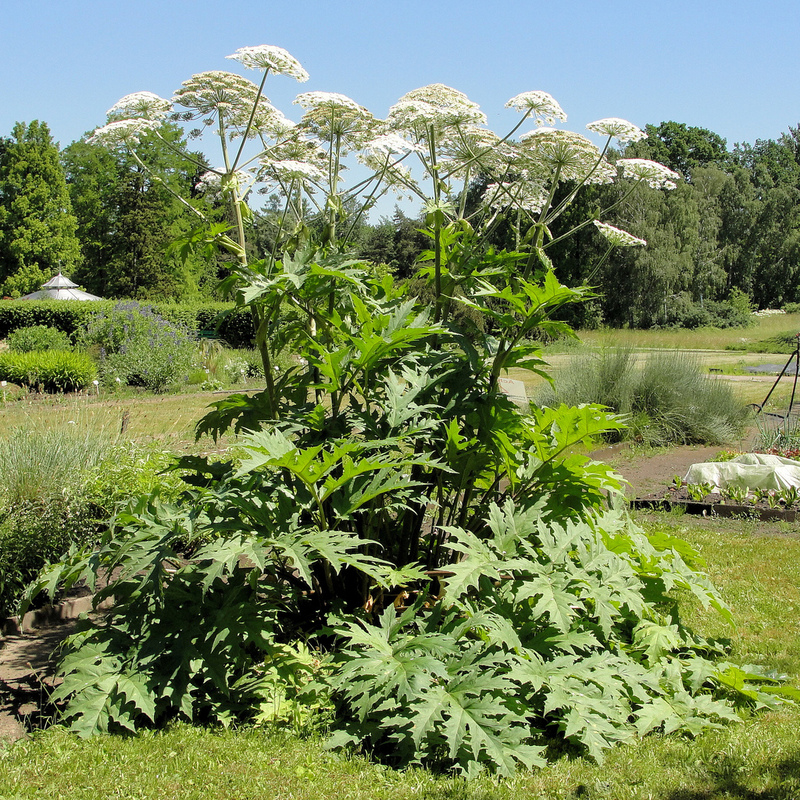 Giant hogweed is so nasty that, in a 1996 Swiss study, it was found to be that country’s second most severely poisonous plant (after deadly nightshade). the common hogweed we have goes above 7ft 6inches - that's the height I can reach too and a lot go over!